Jeff Bezos's Blue Origin rocket company just scored a major contract. His company's BE-4 engines will power United Launch Alliance's Vulcan Centaur, a new suite of rockets that will aim to better compete with Elon Musk's SpaceX on price. Its first launch is slated for 2020. The contract award with ULA marks a high-profile vote of confidence for Bezos's space startup. "We are very glad to have our BE-4 engine selected by United Launch Alliance. United Launch Alliance is the premier launch service provider for national security missions, and we're thrilled to be part of their team and that mission," Blue Origin CEO Bob Smith said in a statement announcing the award on Thursday. ULA, a venture co-owned by longtime government contractors Boeing (BA) and Lockheed Martin (LMT), competes with SpaceX to launch sensitive national security satellites for the US government. But the company had to rely on Russian made RD-180 engines to get its workhorse Atlas V rocket into orbit. That's caused some political headaches for ULA. Bezos, who has said he's funding Blue Origin in part by selling about $1 billion worth of his own stake in Amazon (AMZN) each year, had competition for the contract: aerospace company Aeroject Rocketdyne (AJRD), which has a storied history of providing propulsion technology for NASA as well as existing ULA rockets, also competed for the ULA engine contract. "ULA has chosen the best systems available to create the Vulcan Centaur," ULA CEO Tory Bruno said in a statement Thursday. Blue Origin's win does not come as a huge surprise. The BE-4 is further along in development than the comparable Aerojet engine, dubbed the AR1, and is expected to be less expensive to make. Bruno previously expressed his preference for Blue's BE-4 over Aerojet's AR1. The announcement "is pretty significant nonetheless," said Bill Ostrove, space analyst with Forecast International. "The fact that [Blue Origin] was able to defeat this established, storied company like Aerojet...it's a major victory for a startup." Bezos founded Blue Origin in 2000. 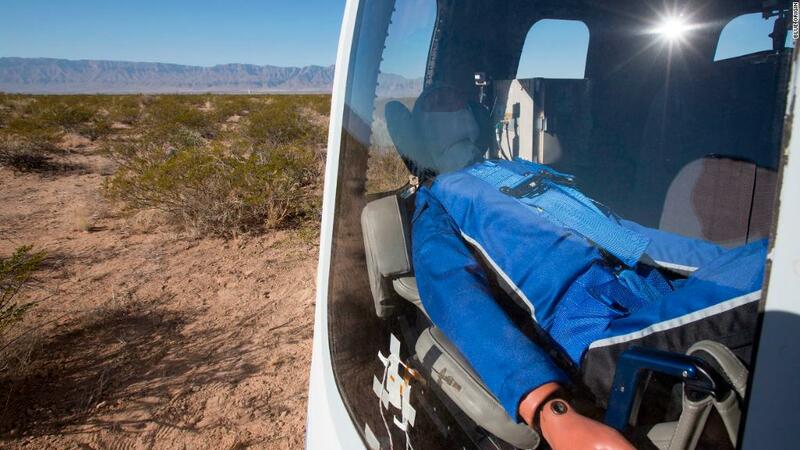 The company has only launched test flights of its suborbital New Shepard rocket, which the company plans to use to fly tourists on short, scenic trips. It began developing the BE-4, a massive rocket engine intended for much more powerful launch vehicles, in 2011. The BE-4 completed its first test fire last year. Blue Origin's contract win means the company will move forward with plans to open a massive manufacturing facility in Huntsville, Alabama. The firm said in July last year that it would build a 200,000 square foot plant that will employ up to 400 new manufacturing jobs if it cinched the ULA deal. It also puts Blue Origin in the enviable position of producing BE-4 engines for two different rockets that will ultimately compete against each other for launch contracts. In addition to supplying ULA's Vulcan, the BE-4 will power a Blue Origin's own heavy-lift rocket, called New Glenn. Those two rockets will also compete against companies like SpaceX and Northrop Grumman (NOC) to land lucrative military launch contracts. Blue Origin's victory marks a "major defeat" for Aerojet because it essentially leaves the company out of the market for developing main engines for any of those heavy-lift launch vehicles, Ostrove said. SpaceX makes engines in-house for its Falcon rockets, and Northrop Grumman is expected to do the same for its OmegA rocket. Nonetheless, Aerojet still has a solid book of business building smaller engines, including one that will power the Vulcan's upper stage. It also produces engines for NASA's Space Launch System. Steve Warren, Aerojet's vice president of communications, told CNN Thursday that Aerojet's AR1 can still be used to power medium-lift launch vehicles. "This could easily become the workhorse engine for America," he said. Ostrove is skeptical. "It's hard to see a place for it in the market," he said. "There's not much activity going on in that medium-class launch market."